tmsEKP™ enables organizations to create, exchange and manage information across a single business-centric workspace, generating knowledge connectivity within enterprises and between businesses through a user-friendly desktop environment. Highly scalable and easily adaptable, it is capable of bolting together modular solutions to rapidly deliver functionality and interactive capabilities. 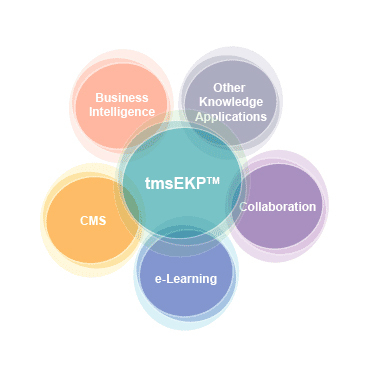 Improving productivity and efficiency through a smart blend of knowledge management and efficient communication, tmsEKP™ allows for quick and timely access to critical corporate data at all levels and transforms knowledge to actionable information to help businesses make intelligent decisions. tmsWORKFLOW™ is a web-based workflow management system that enables organizations to achieve task completion on time and at reduced costs, through a simple interface. With a skillful integration of structure and system, it equips managers, executives and staff at all levels with tools to manage processes and meet business objectives that are aligned with company strategies and financial targets, thereby maximizing resources and boosting productivity. is a graphical tool that enables the creation of visual process flows of business processes. In order to design the process, participants, activities and business rules are defined based on the organization's business policies and procedures. The design is then deployed directly from the Workflow Designer to the Workflow Engine.